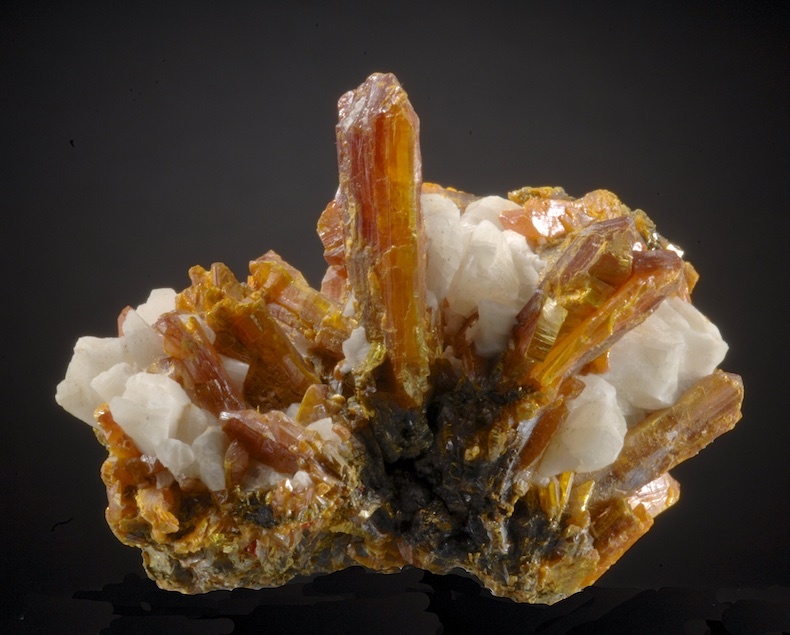 A good clean vug of densely packed Scorodite crystals from Bou Azzer. The crystals reach 6mm but most are smaller. The color is mostly green but a few blue-purple prisms are seen on some edges. From finds about 12 years ago, this is a very good representative specimen with good coverage. 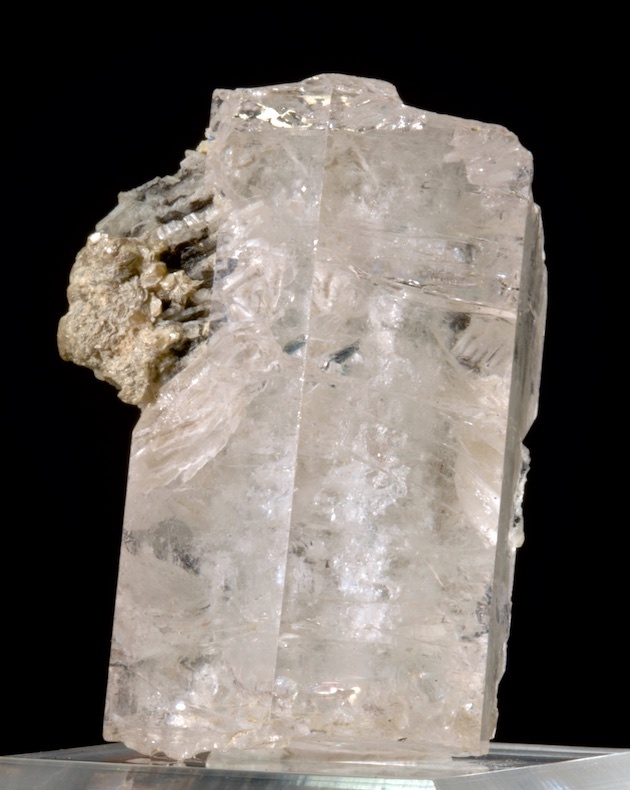 A clear, colorless Beryl crystal with double termination (crude but complete) and very glassy faces. Fine transparency and interesting internal structures are easily visible. It is surprising how very uncommon colorless Beryl (Goshenite) is. This specimen is ex Les Hitchings collection, obtained in 1968 by him. A high percentage of this is facet grade gem, the backside is contacted and included by Clevelandite but overall the prism is complete and choice. A thin fan like sheet and branching Copper crystals that is partly coated with Cuprite. 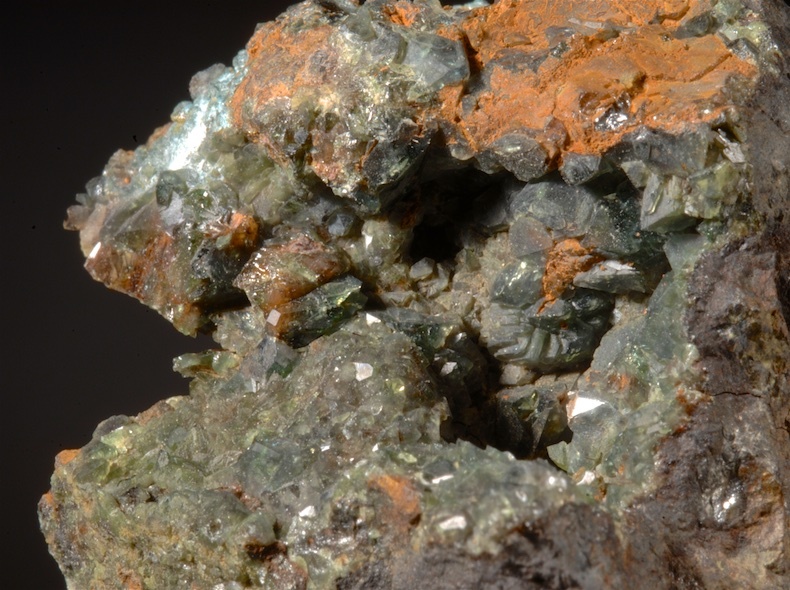 The Cuprite is in epitaxial crystals and flattened on the Copper. From the Ray mine where many fine Coppers were found, this example is illustrative of the thin vein fillings and coatings that were so significant there. 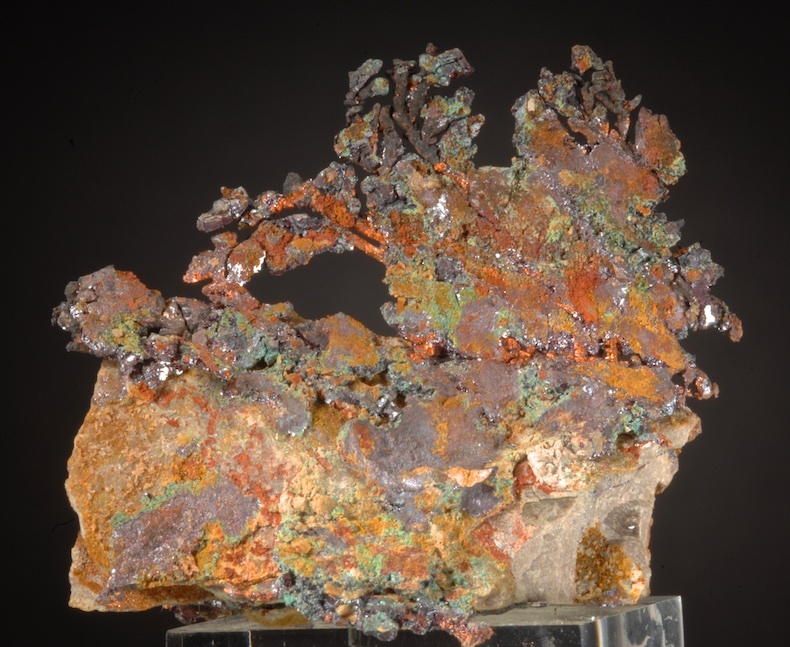 In fine condition and a colorful example, some secondary Copper oxides add a green color to contrast the red Cuprite and metallic Copper hues. 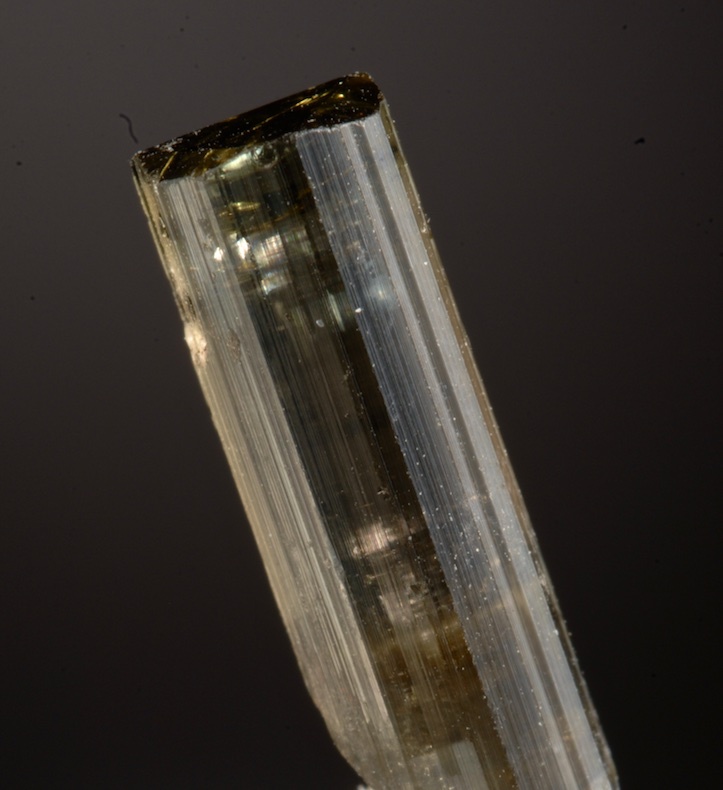 A cute Tourmaline thumbnail ex Larry White collection that has a very unusual color and becomes colorless when rotated in polarized light. This is undamaged and very transparent (the photos do not show the transparency well). 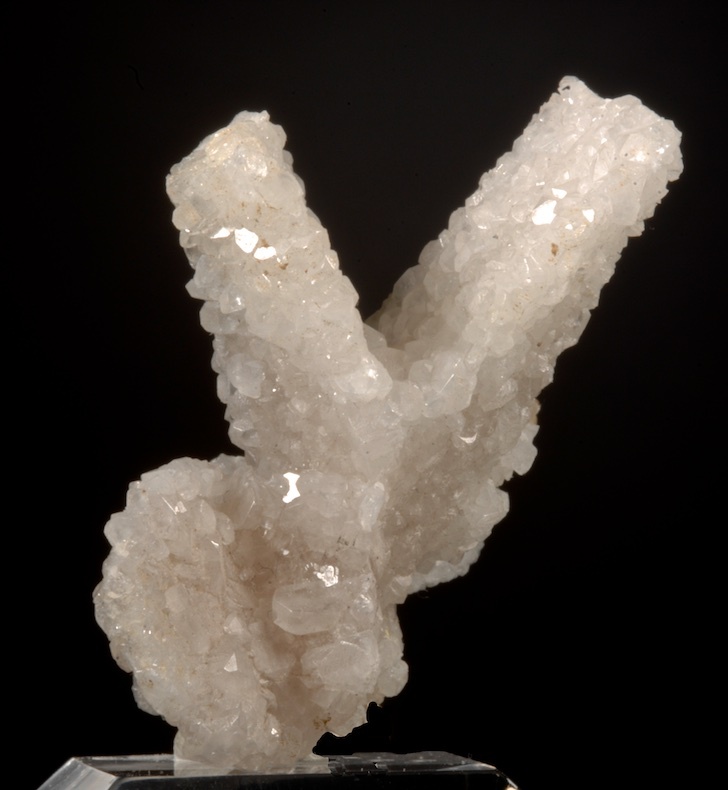 A nice, glassy little gem crystal that is very unusual for the locale. 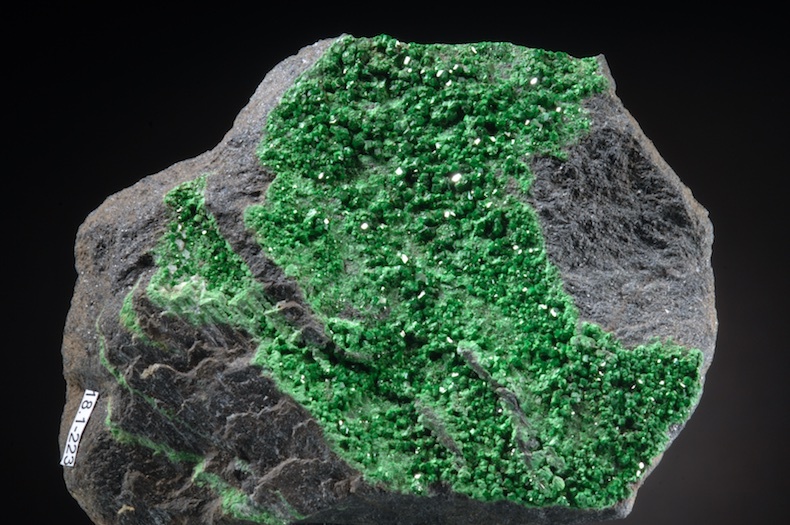 Large, densely crystallized plate of very bright green Uvarovites from the classic original locality in the Urals. Intense color (this is a true Chromian Garnet) and these crystals are very sharp, distinct and glassy. A sizable, eycatching piece, this is sawn on the backside where it was collected, the sawn area is not visible on display. Uvarovites are one of the rarest Garnets, and only a few places have ever produced any of quality. A choice clean gem clear deep blue Fluorite from the new finds in Fujian province. 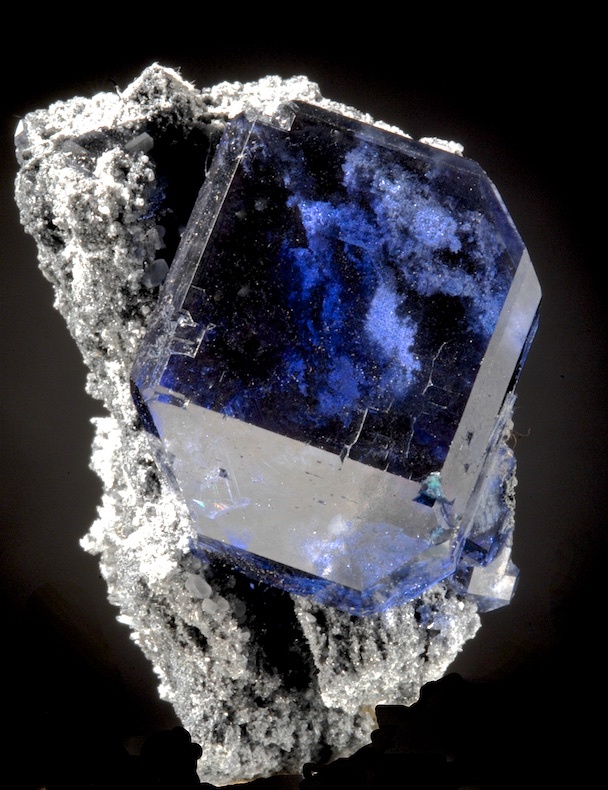 The Fluorite is fully transparent, 3.1 CM in diameter and nicely perched on a dark matrix. In fine condition there are some tiny geometric edge contacts but no damage, and the clarity is such that you can clearly see the druzy Quartz crystal matrix through the Fluorite. These have a strong color change in daylight vs incandescent and are either a royal purple or a deep indigo blue depending on the light source. This find has produced quite a few specimens but the vast majority have damage or other issues. Choice pieces like this are very few and already hard to get. Lots of impact in any display.